Santa now has 19 new Christmas Presents to give out from his Secret Santa Event. 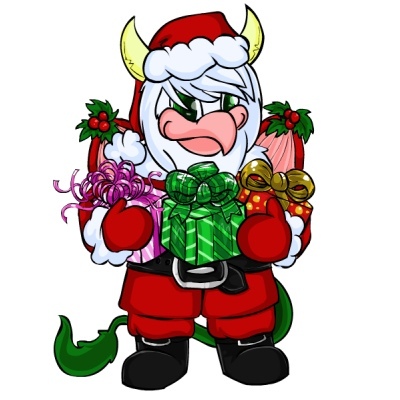 Complete any Secret Santa Quest and a random player online will be sent a Christmas Present item from you. If he is feeling more generous, you will also receive a Christmas Present! Remember, this event ends December 25th. Open one of these new Christmas Presents and you will win one of these 22 new prizes. If you wait until December 24th or 25th to open them, you will win double prizes! Our Christmas Carol Singing Event has just started. It will end automatically December 31st. Everyone can take part for FREE! You can visit the profile of any player that is currently online, hit the 'Sing Carols' button and you may receive a prize. You can only visit each person once per day and you will receive MP or an item. All of these item prizes will retire at the end of this event too! If your character is wearing an approved Christmas Costume you are guaranteed an item or MP prize at every visit. Players without the costume can still take part, but on average only a quarter of all visits will receive any kind of prize. This means that players with an approved costume will win 4 times more prizes! We understand there is some frustration and confusion over the Christmas gifting rules and we would like to try to make things a little simpler for everyone at this time of year. The rule was put in place to safeguard hacked accounts and to discourage multiple accounts, it was not really meant to take the joy out of Christmas and stop players from sending items to their friends or from taking part in Secret Santa events. From now until December 25th players can gift items to friends and send Secret Santa items WITHIN REASON. We realise that all accounts have different values so to set an mps limit is not really fair. You may send items that you can easily afford without your account being left poor or empty. Please remember that staff can see all account transactions and will be watching these closely. Anyone who tries to use the "Christmas gifting" to send their items/mps to a friend/sibling or multiple account will still have their account frozen along with the receiving account, as per normal procedure. You do so at your own risk and have been warned. A new Weekly Quest Contest has just started. This week's quest game is Secret Santa. The challenge is to complete as many of these Quests this week. The top 3 players at the end of the challenge will receive a Anime Costume, 200,000MP and a Gold Trophy, the next 6 players will receive 150,000MP and a Silver Trophy and the next 9 players will receive 100,000MP and a Bronze Trophy. The 2018 Advent Tree prizes have now been released. If you have completed the full set of Advent Tree Instructions, you can now visit the Advent Tree in Biala Mountain to claim your prizes. There are 14 new items to be claimed and this year you will receive 3 of each item! The 2017 prizes are no longer available and have been retired. All completed School and University lessons will receive DOUBLE STATS until December 31st for all pets wearing Advent, Angel, Blitzen, Christmas, Christmas Tree, Elf, Gingerbread, Ice, Polar, Seasonal, Snow, Snowman, Tundra or Winter Costumes. The Elite Gym and Gym has just started DOUBLE STATS TRAINING until December 31st for all pets wearing Advent, Angel, Blitzen, Christmas, Christmas Tree, Elf, Gingerbread, Ice, Polar, Seasonal, Snow, Snowman, Tundra or Winter Costumes. A new set of limited edition Christmas items are now on sale at the Account Upgrades Shop. They will all automatically retire December 31st. A new Weekly Battle Contest has just started. This week's opponent is Troll. You will need to have a Troll Trading Card in your Battle Deck. The challenge is to win as many battles against this opponent this week. The top 3 players at the end of the challenge will receive a Lightning Gobble Trading Card, 200,000MP and a Gold Trophy, the next 6 players will receive 150,000MP and a Silver Trophy and the next 9 players will receive 100,000MP and a Bronze Trophy. Elfember is the season for giving but not every Marapet may deserve to be rewarded. 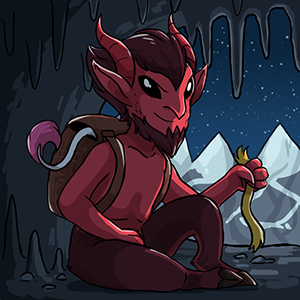 Krampus is back and will be here until January 1st. Pets wearing an Advent, Angel, Blitzen, Christmas, Christmas Tree, Elf, Gingerbread, Ice, Polar, Seasonal, Snow, Snowman, Tundra or Winter Costume can visit Krampus every 15 minutes. All other pets can visit every 30 minutes. The Lottery has been drawn for this week. MoonbeamRyder is the winner of the 2,394,400MP Jackpot with the winning numbers of 14, 19, 24, 25, 27 and 30. Congratulations! Last Week's Raffle has now ended. _Fire_ is the winner of the Red DNA and 100,000MP prize with the winning raffle ticket number 701896. Congratulations! Make sure you buy your tickets for today's raffle - only 10MP per ticket! The Game of the Week has changed to Hexxagon and this week's Olympics Event is Running. All pets wearing a Anime Costume will receive Double Training stats this week at the Gym and Elite Gym. Vote Now for next week. All pets wearing a Love Costume will receive Double Education stats this week at the School and University. Vote Now for next week. The Angel Costume was first released in June 2006 in Account Upgrades and the costume has been retired and forgotten about ever since. A new version of the Angel Account Upgrade has been released, with 7 new Angel themed items and either a Angel coloured Vixen or Kaala Enchanted Plushie. This AU will retire January 15th. The Basil, Bolimo, Decadal, Eyru, Flab, Jessup, Raulf and Straya can now wear the Angel Costume. Most of the oldest and worst Angel pets have been updated to match the new style. A new Weekly Quest Contest has just started. This week's quest game is Simerian Excavator. The challenge is to complete as many of these Quests this week. The top 3 players at the end of the challenge will receive a Gothic Costume, 200,000MP and a Gold Trophy, the next 6 players will receive 150,000MP and a Silver Trophy and the next 9 players will receive 100,000MP and a Bronze Trophy. Santa Claws has stopped his normal Quests until January 1st. Instead of rewarding you MP for completing his quest, he will instead give you one entry to his New Years Raffle. The more quests you complete, the more entries you will have. The New Years Raffle will be announced late January. There will be 100 winners of 1,000,000MP, 3 winners of £25 Account Upgrades Credit, 10 winners of £10 Account Upgrades Credit and 25 winners of £5 Account Upgrades Credit. There will also be 2 prizes of each of these costumes : Advent, Angel, Blitzen, Christmas, Christmas Tree, Elf, Ice, Polar, Tundra and Winter. Hundreds of new, bonus items will also be won! A new Weekly Battle Contest has just started. This week's opponent is Pembe. You will need to have a Pembe Trading Card in your Battle Deck. The challenge is to win as many battles against this opponent this week. The top 3 players at the end of the challenge will receive a Ogul Trading Card, 200,000MP and a Gold Trophy, the next 6 players will receive 150,000MP and a Silver Trophy and the next 9 players will receive 100,000MP and a Bronze Trophy. For a limited time only, the retired Sagittarius Treasure Chest and Winter Treasure Chest from 2015 are back on sale at the Account Upgrades Shop. They will both automatically retire December 18th. The Christmas Elf has returned to Marada just in time for Christmas! Make your account look festive with lots of red and green because Elf will be visiting profiles, looking for members with a festive themed doll and rewarding them with gifts. Elf will also be showing up on the forums with give aways for deserving players who have festive dolls, signatures and avatars. You could get rare and retired items or even a festive LE pet. There are 4 new Elf Prizes to be won this year! Elfember is here and we have so much to look forward to! Be sure to visit us this month to take part in all of the usual events including Secret Santa, Carol Singing, Krampus, our daily Advent Calendar, limited edition Account Upgrade items, new Capsule Machine items, Advent Tree and much more! The Account Upgrades Shop also has 3 random pieces of the Advent Tree Instructions on sale until December 31st. If you have not completed this map yet, complete it ASAP and you can claim last year's prizes before the 2018 prizes are released. Hurry though, once the 2018 prizes are released the 2017 will be retired! The Lottery has been drawn for this week. DollyS is the winner of the 1,900,000MP Jackpot with the winning numbers of 2, 4, 17, 32, 45 and 48. Congratulations! Last Week's Raffle has now ended. Twinkling is the winner of the Red DNA and 100,000MP prize with the winning raffle ticket number 686569. Congratulations! Make sure you buy your tickets for today's raffle - only 10MP per ticket! All pets wearing a Coral Costume will receive Double Training stats this week at the Gym and Elite Gym. Vote Now for next week. All pets wearing a Snowman Costume will receive Double Education stats this week at the School and University. Vote Now for next week. The Advent Tree prizes will be released later in the month. If you haven't already completed this map, you can do so before the prizes are released to receive the 2017 prizes before they retire. The November 2018 Monthly Checklist winners have been announced and the prizes have been rewarded. Congratulations to all of those who have won. Don't forget, this is a monthly permanent feature that you can enter for FREE. If you haven't already, it's time to start entering the December event! A new Weekly Quest Contest has just started. This week's quest game is Microwave. The challenge is to complete as many of these Quests this week. The top 3 players at the end of the challenge will receive a Gnome Costume, 200,000MP and a Gold Trophy, the next 6 players will receive 150,000MP and a Silver Trophy and the next 9 players will receive 100,000MP and a Bronze Trophy.